What does craft today say about identity, community, society? “Disrupting Craft: Renwick Invitational 2018” opening Nov. 9, presents the work of Tanya Aguiñiga, Sharif Bey, Dustin Farnsworth and Stephanie Syjuco, four artists who explore these questions by challenging the conventional definitions of craft to disrupt the status quo. 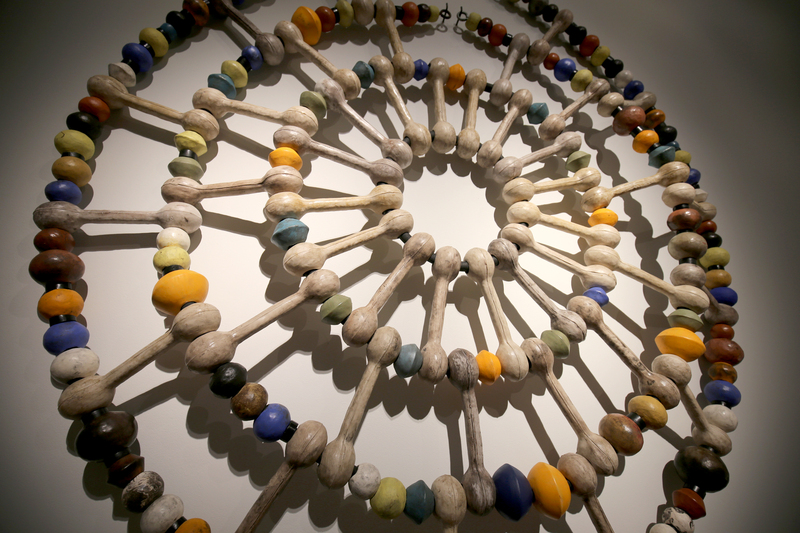 Working in a wide range of materials—including ceramics, glass, wood and fiber—these artists all share a dedication to social practice that they convey through their handmade artworks. They proactively respond to contemporary issues by reaching beyond their studios to promote collective engagement. They weave elements of performance and installation art into their work to encourage challenging conversations within their communities. The exhibition is organized by Abraham Thomas, the Fleur and Charles Bresler Curator-in-Charge at the Renwick Gallery of the Smithsonian American Art Museum. 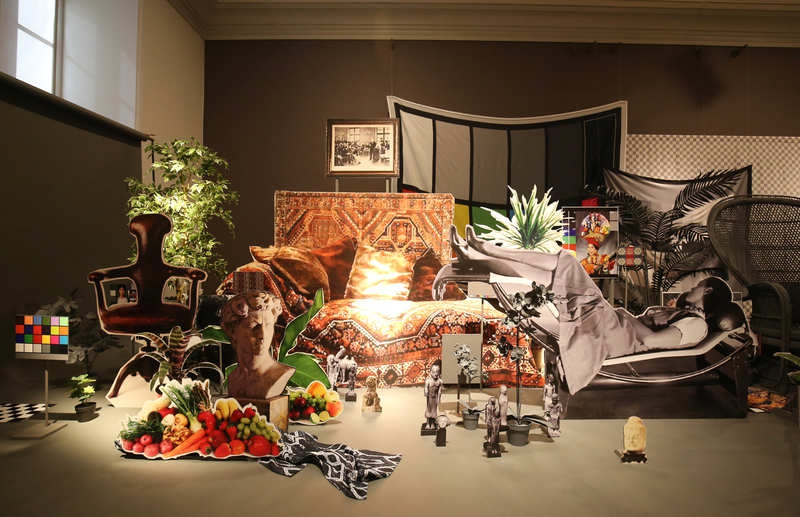 It includes more than 50 objects, presenting a range of works by each artist and is on view at the museum’s Renwick Gallery through May 5, 2019. The artists were selected by Thomas; Sarah Archer, independent curator, writer and contributing editor for American Craft Inquiry; and Annie Carlano, senior curator of craft, design and fashion at the Mint Museum in Charlotte, North Carolina. Farnsworth was profoundly affected by the post-industrial devastation of his hometown Lansing, Michigan, and subsequent artist residencies in Wisconsin and North Carolina where he witnessed critical moments of social unrest. He works primarily with wood to create intricately detailed sculptural works imbued with haunting storylines and nested layers of meaning—from abstract geometrical forms and sculptural portraits to miniature theaters and kinetic works. He produces collective portraits of communities struggling with the aftermath of economic decline, police brutality and high school shootings. 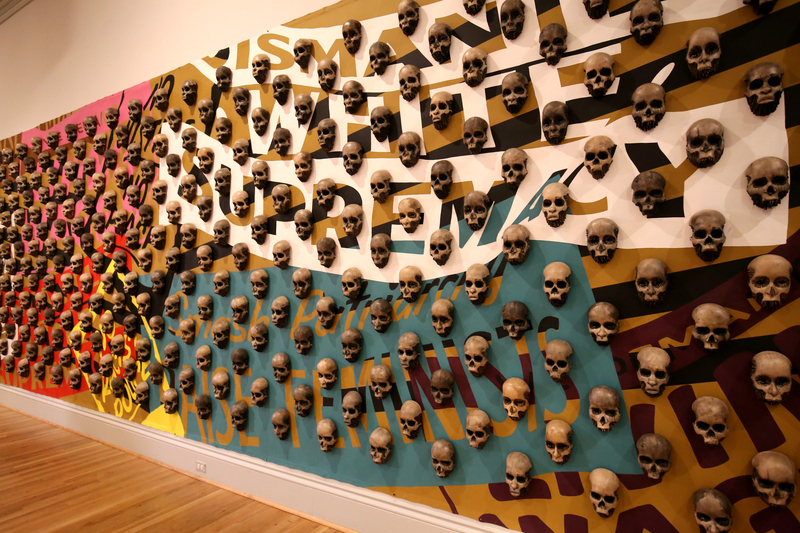 His most recent work, “The Reconstruction of Saints,” incorporates audio recordings of young people from Charlotte, who share their hopes and fears. This participatory project, with its elements of oral history and community engagement, introduces a new way for Farnsworth to explore the legacy that is being left for younger generations. Short biographies for each artist are available online at americanart.si.edu/exhibitions/invitational-2018. “Disrupting Craft” is the eighth installment of the Renwick Invitational, established in 2000 to highlight outstanding craft artists who are deserving of wider national recognition. To celebrate the opening of the exhibition, the Renwick Gallery will host an open house Friday, Nov. 9, from 10 a.m. to noon when visitors will have an opportunity to talk with the artists; a gallery talk led by Thomas follows at noon. Wednesday, Dec. 5, at 7 p.m., the Art21 episode featuring Syjuco will be screened at the museum’s main building (Eighth and G streets N.W.) in the McEvoy Auditorium as part of the “Movies at SAAM” series; Syjuco will talk about her work the following day, Thursday, Dec. 6, at noon at the Renwick Gallery. Bey will give a gallery talk Friday, Jan. 25, 2019 at noon in the exhibition galleries. The following day, Saturday, Jan. 26, Bey will participate in a “Community Ceramic Demonstration” from 11 a.m. to 1 p.m. at the Smithsonian’s Anacostia Community Museum, located at 1901 Fort Place S.E. in Washington, D.C.; registration is required. The museum’s popular Handi-hour program Wednesday, Nov. 14, from 5:30 to 8:30 p.m. will capture the spirit of “Disrupting Craft” by encouraging participants to create their own linoleum stamp with a personally meaningful phrase or image. Handi-hour Wednesday, Jan. 30, brings back felting as the featured craft, inspired by Aguiñiga’s work in the exhibition. Tickets ($25) for the November program are available now for purchase at AmericanArt.com/handihour; tickets for the January event will be for sale beginning Jan. 7, 2019. The Smithsonian American Art Museum celebrates the vision and creativity of Americans with artworks in all media spanning more than four centuries. 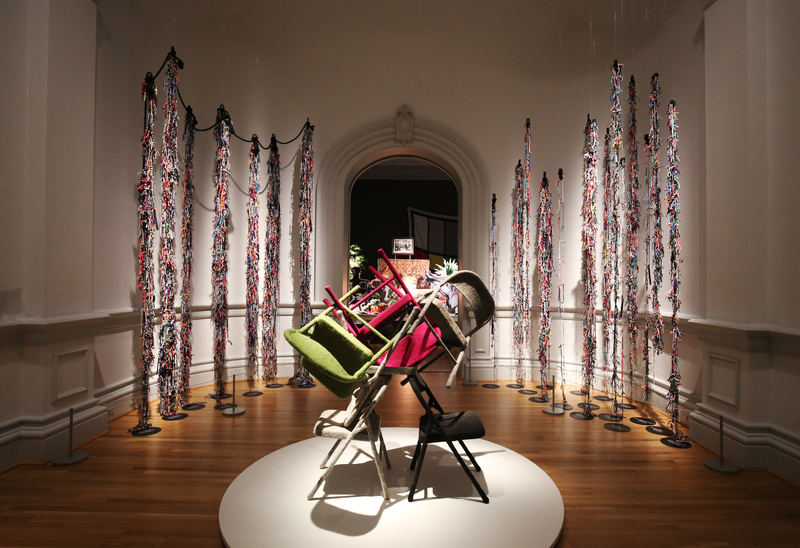 The Renwick Gallery is the museum’s branch for contemporary craft and decorative arts. The Renwick is located on Pennsylvania Avenue at 17th Street N.W. and is open daily from 10 a.m. to 5:30 p.m. (closed Dec. 25). Admission is free. Follow the museum on Facebook, Instagram, Twitter and YouTube. Smithsonian information: (202) 633-1000. Museum information (recorded): (202) 633-7970. Website: americanart.si.edu. Louie Bones-Omega, 2017, erthenware, vitreous china and mixed media. Collection of the artist. Photo by Decon Harper Gelhar. 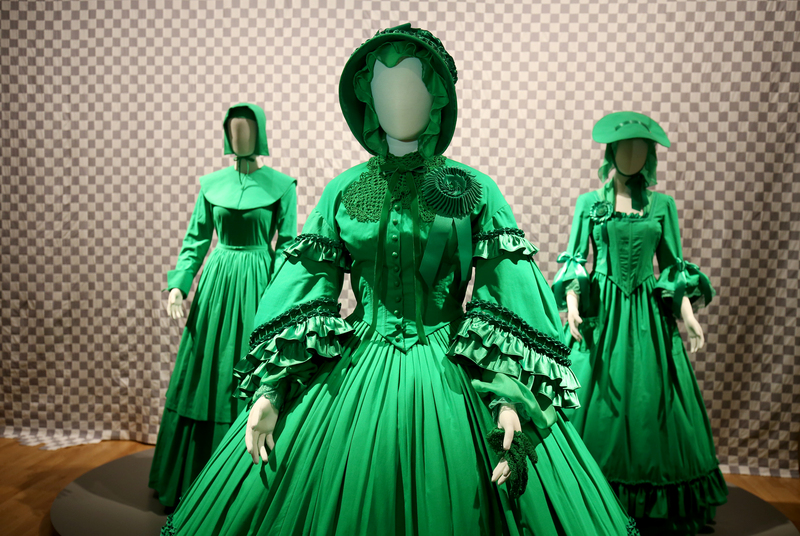 Stephanie Syjuco,The Visible Invisible: Plymouth Pilgrim (Simplicity), Antebellum South (Simplicity), Colonial Revolution (McCall's), 2018, cotton muslin, chromakey backdrop fabric, polyester satin, crocheted cotton, ribbon, lace, buttons and display form. Collection of the artist. Stephanie Syjuco, Natural Calibration Studies (Ornament + Crime), 2016. Collection of the artist and Nion McEvoy. Photo by Libby Weiler.